Unique white blend made from six grape varieties. Beautiful, soft and balanced mouth feel rich bouquet of tropical and floral notes. An abundance of tropical fruit and floral notes on the nose followed by hints of white pear and fruit salad on the palate. Soft, beautifully balanced mouth-feel. Harmoniously blended! The grapes were hand-harvested and crushed in February and March. The juice settled and was fermented in stainless steel tanks. The wine was aged on the lees and blended before bottling. 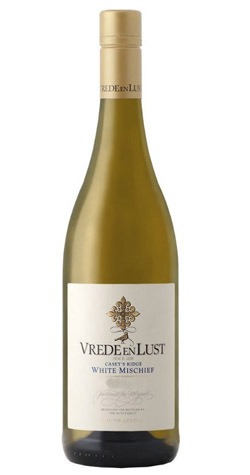 Vrede en Lust, derived from the Dutch “Peace and Eagerness” is a modern wine farm, building on a 320 year old foundation. The farm is located in the center of the Cape Winelands, on the eastern slopes of the Simonsberg, and nestled in between the top notch Rupert de Rothschild (Fredericksburg) and Plaisir de Merle estates. The vineyards are classified under the Wine of Origin ward Simonsberg-Paarl, as part of the Paarl Wine Region.